A for “Grade A” and 99 for “continuous effort and improvement”. A99 is headquartered in Toronto, Canada. It is one of the leading names when it comes to golf gear whether it’s golf balls, clubs or bags. Conceived in 2003 the company has garnered a stellar reputation since its inception. Boasting an extensive portfolio of award-worthy products. The A99 Golf C4 Sunday bag showcases the same traits as the other products in the company’s stable. It comes with a myriad of features often seen in only higher priced models in its segment. Available in a choice of four exciting color combinations. Black/grey trim, white/black trim, navy/grey trim and red/grey trim. This Sunday golf bag features a compact footprint yet is generously spaced in the interior. Certainly enough room to accommodate your essential golf gear and more. Who is This Golf Bag For? The Golf C4 Sunday golf bag is truly in a league of its own. It has a wide range of excellent features tucked away neatly into a sleek design. For starters this superior quality Sunday golf bag features a robust construction. You can rest assured it will serve you well for years to come. Measuring 5” (12.7cm) top, 50"(127cm) high, 33" (83.82cm) for the shaft tube body. Tipping the scales at just under 5 lbs. the Golf C4 Sunday golf bag is extremely lightweight. This bag would be a joy to carry for your time walking the course. In terms of interior space and slots. It takes home the cake with its shaft tube body that can accommodate up to 6 clubs with ease. Further, it can be ordered in several different appealing color combinations. Allowing you to choose one that matches your golf apparel. 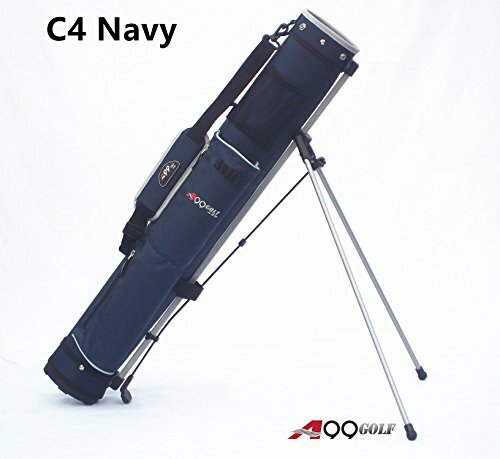 One of the pitfalls of the Golf C4 bag is its non-collapsible design. On a brighter note it allows you to easily put the clubs back into the bag. The Golf C4 Sunday bag is geared towards both novice and seasoned golfers or anyone looking for a lightweight alternative to regular bulky bags. Its waterproof construction prevents your gear from getting soaked in wet weather conditions. The removable cover ensures the water doesn’t seep in. Regular golf bags can be heavy and put a strain on your shoulder. Especially when hauling them around 9 or 18 holes without a golf cart. The C4 Sunday golf bag however is lightweight but comes with a limited number of pockets forcing you to leave the non-essentials at home. To top things off it's fitted with a plush padded single strap. This will work great for golfers suffering from shoulder or back ailments. The package of the A99 Golf C4 Sunday bag includes the bag, removable top cover and shoulder strap with a stand. You will have a put a few of the pieces together before heading out to the course such as the strap and stand. The C4 Sunday bag weighs less than 5lbs. and so it's easy to carry easy even when loaded up. Unlike other bags in its segment it can be ordered in a choice of four color combinations. This allows you to buy one that matches your gear. The C4 golf bag by A99 is crafted from high quality 600D nylon. It arrives complete with a PVC backing and laminate PE tube, which enhances its overall durability and strength. The top cover of the bag not only protects your gear from wet conditions but allows easy access to them. It is equipped with a 600D nylon and comfort filled webbing handle to carry for longer periods with ease. For a Sunday golf bag the C4 surprisingly comes with several dedicated slots to hold your gear. Including one mesh pocket, two zippered accessory pockets and a two-way divider pocket to stack your 6 clubs neatly. 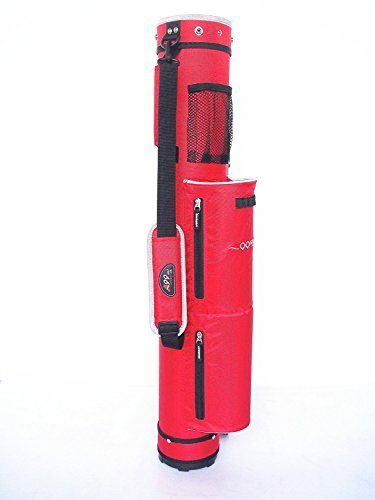 A full-length zippered panel entry allows to easily remove the clubs and put them back. The bag is light to carry on your shoulder for the course of the game or set in on damp grass. An integrated stand allows to prop the bag in a secure portion on the green. For a bag that can be folded for easy storage the JP Lann Sunday Golf Bag is probably a better option for you. It is made from durable waterproof polyester and features a zippered ball pocket for additional storage. When shopping for a compact and sleek golf bag you really can’t go wrong with the A99 C4 Sunday golf bag. The bag comes with a massive list of premium features such as a stand to support it while you play. It has a well-padded strap to comfortably carry it around the course. It is waterproof which protects your gear against wear and tear in wet weather conditions. The bag even features a full-length zipper panel at the front for easy access to your clubs. Several dedicated pockets including a mesh pocket, accessory pocket and two-way divider at the top. In terms of durability, the A99 C4 Sunday golf bag doesn’t disappoint with its 600D nylon construction. Mated with a PVC backing for top-notch strength and durability it's a good combination for construction. The bag can also be had in a choice of four-color combinations. Including black/grey trim and red/grey trim making it a perfect fit for male and female golfers alike. If you’re looking for a Sunday golf bag that can be carried around without breaking a sweat. This one comes with a wide range of class-leading features. The A99 C4 Sunday golf bag is worthy of a second look.